Steven Blair’s recent report on the .300 WSM for F-Class stirred quite a bit of interest. If you’re a serious F-Open competitor, you’ll definitely want to read that article, which covers the pros and cons of the .30-Cal WSM loaded with the ultra-high-BC 230gr Berger Hybrid bullets. If you’re thinking about building a .300 WSM for F-Class, here’s a rig that can give you some design and hardware ideas. 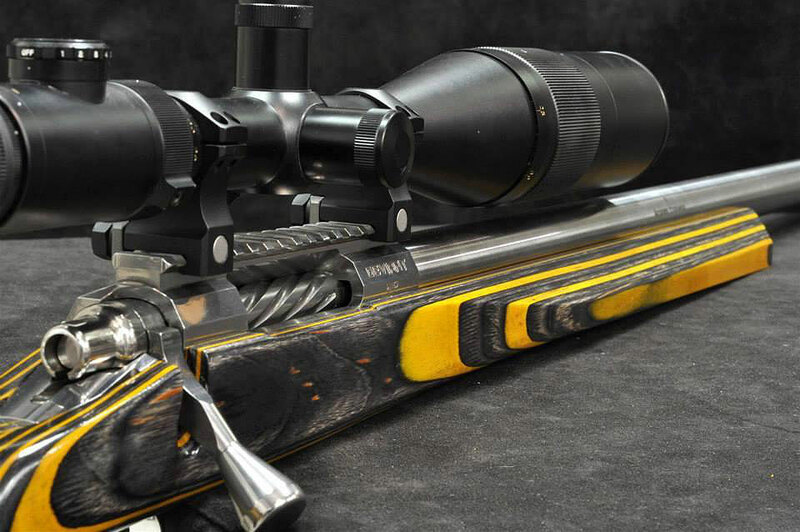 This eye-catching custom .300 WSM F-Open rig belongs to Forum member Keith T. (aka “KT”). 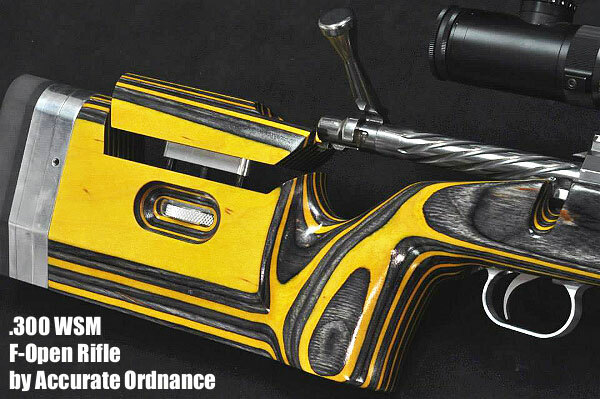 With its striking “bumblebee” color scheme, it will certainly get noticed on the firing line. Click Photos to see full-screen versions. Forum member Keith T. (aka “KT”) just got his hands on his new .300 WSM for F-Class and long-range competition. 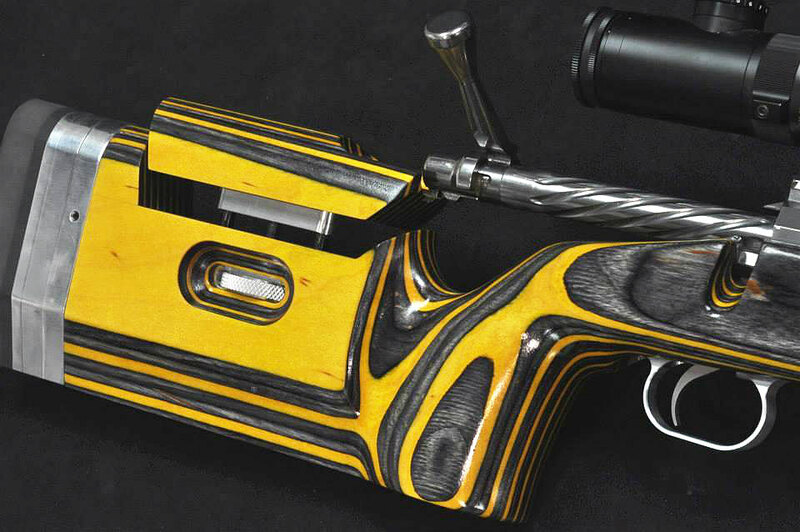 It’s a handsome brute, decked out in a “bumblebee” (yellow and black) laminated stock. Keith’s rifle features a Defiance Machine Deviant Long Magnum action (with Jewell trigger) in a Precision Rifle & Tool (PR&T) F-Class Lowboy stock. Keith has two 30″-long, 1:9″-twist barrels for the gun, one made by Brux Barrels, and the other by Bartlein. Both barrels have identical .300 WSM chambers cut with the same reamer. Keith will test both and then use the best-performing of the two in competition. Riding on top is a Nightforce 12-42x56mm Benchrest Model scope. All the work was done by Accurate Ordnance (AO), based in Winder, Georgia. Keith reports: “This one took a while to get built due to parts availability issues, but I’m glad it’s done! Thanks to Accurate Ordnance and Nightforce and all their help.” NOTE: Accurate Ordnance tells us that a rifle like this can normally be completed in 6-8 weeks, once all key parts are in hand. Share the post "Bumblebee .300 WSM F-Open Rig with Defiance ‘Deviant’ Action"